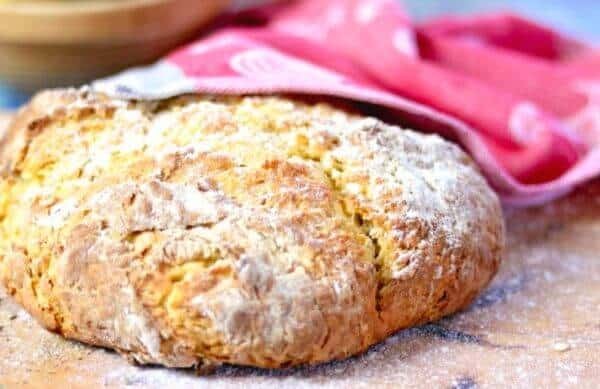 Irish soda bread is an easy quick bread recipe that’s traditional in Ireland – and gets lots of attention around St Patrick’s Day in the United States. The best versions are crusty on the outside with a buttery, tender crumb – almost like a giant biscuit. Some people use buttermilk and some use sweet milk – buttermilk is used in this recipe. I make all kinds of bread – yeast breads, quick breads, rolls, muffins – you name it and I’ve tried making it. One of my favorite types of bread to make out of all of them is a fat, crusty loaf of Irish Soda bread. When I think of Ireland I think of countryside full of lush green grass spotted with sheep, winding roads, small villages with ancient, whitewashed houses… and lots of hearty country food. Soups and stews served with big chunks of soda bread, warm from the oven with butter melting and soaking into the crevices. If it’s not that way please don’t enlighten me. This easy, crusty quick bread is absolutely perfect for those hearty stew type meals because the crust gives a satisfying crunch while the crumb soaks up broth without getting soggy. There’s no waiting for it to rise or long baking times – and it’s versatile enough to be a little sweet or just buttery or even a little savory. If you really want your Irish soda bread to taste authentic try using half whole wheat flour in this recipe. Blend the dry ingredients and grate the ice cold butter into them, tossing often to keep the butter shreds from sticking together. Whisk the egg and buttermilk together until well blended and add to the dry ingredients, stirring quickly and gently. Don’t overmix! Mix the dough gently until it holds together – it will have a crumbly shaggy look. Turn it out onto a lightly floured countertop and pat it into a round. Slash and X in the top. I like to sprinkle the top with sugar if it’s being served for brunch. Remove the finished loaf from the oven when it is golden brown and crusty – a toothpick inserted in the center will come out with just a few crumbs clinging to it. Let it cool for 10 minutes or so before serving. 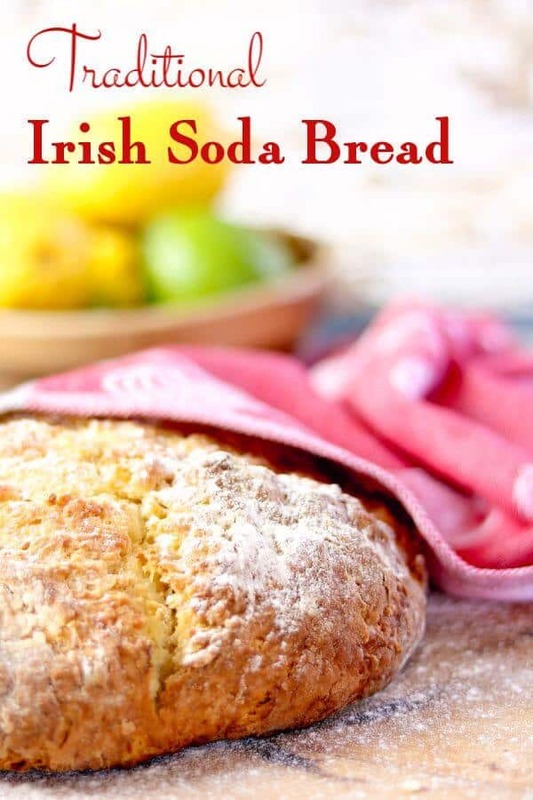 Is Irish Soda Bread really Irish? Yep – it sure is! 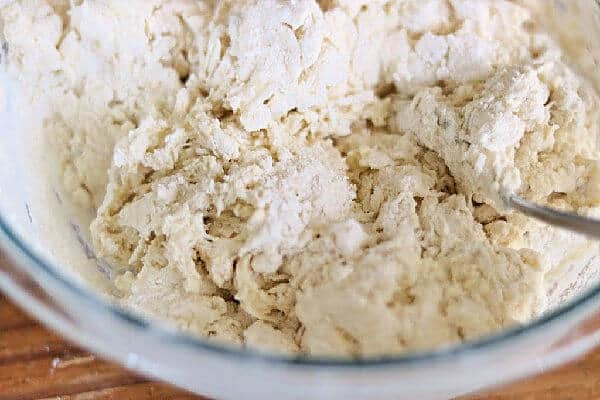 It dates from the early 1800s and was made with just four baking ingredients – flour, baking soda, sour milk, and salt. 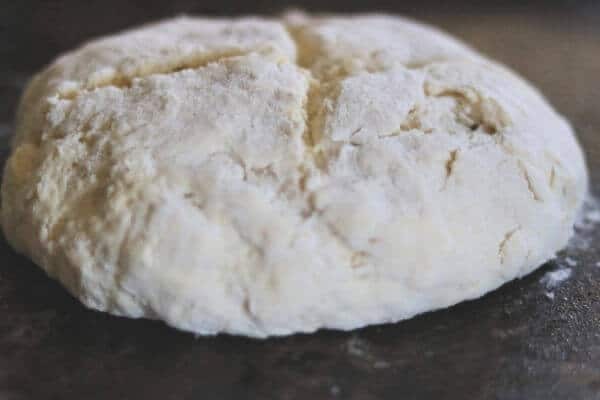 Since families lived in farmhouses with only open hearths for cooking this easy bread was developed to easily cook on cast iron skillets or pots over the fire. Why Is there a Cross or X on the top of the loaf? Tradition has it that before baking, a cross is cut on the top with a knife, to ward off the devil and protect the household. On a more practical note it also helps the bread to rise and bake evenly. Yes! Wrap it tightly and freeze it for up to 3 months. Thaw and reheat before serving. How long does soda bread keep? Since soda bread dries out very quickly keep it wrapped tightly with plastic wrap for up to 3 days at room temperature – no need to refrigerate. Freeze for longer storage. How do you reheat Irish Soda Bread? Thaw if it’s been frozen. Unwrap the bread and reheat it on a heavy baking sheet in a 325F oven for 10 minutes. Why do you grate the butter instead of cutting it in like other recipes? Although most recipes call for cutting in the butter I like to grate it because the long strands make the bread bake up flakier and even more buttery. 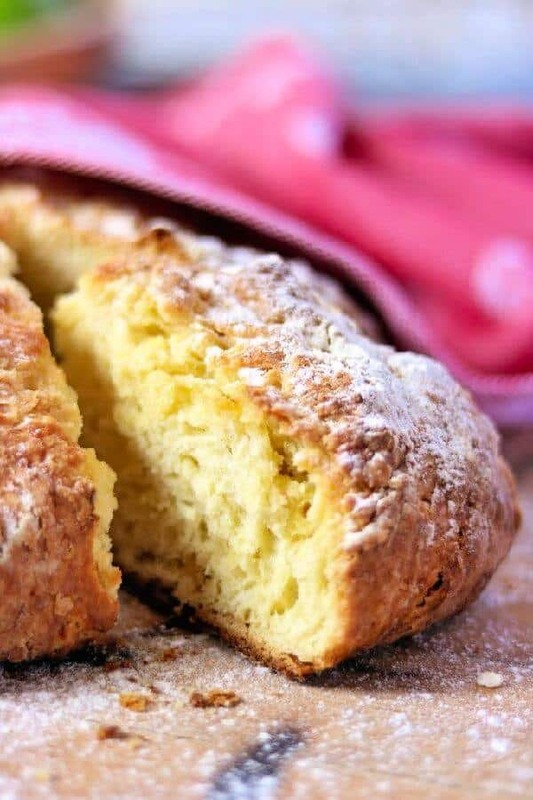 Authentic Irish Soda bread has a buttery crumb and a crusty top. I am absolutely IN LOVE with this Irish Soda bread baking dish with the Celtic knot design. Here are some more of my favorite quick bread recipes! And I’m loving this easy Skillet Cornbread from Bowl Me Over. Crusty, tender, buttery, and tangy all at the same time, this easy quick bread is a must have for comforting soups and stews! 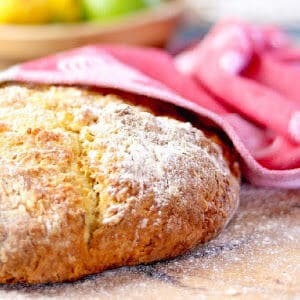 Simple Irish Soda Bread recipe that is buttery, crusty perfection. Serve it warm from the oven for best flavor. 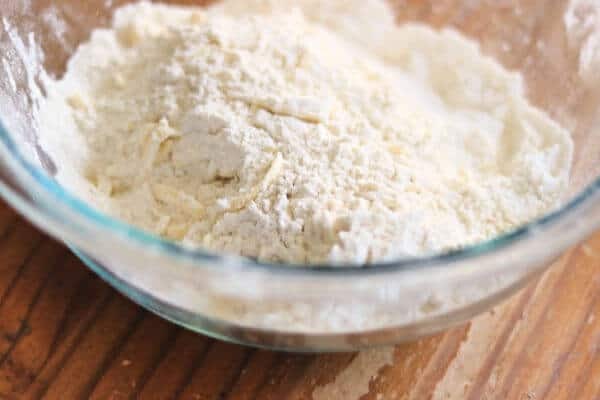 Blend the flour, sugar, salt, and baking soda in a large bowl. Using the large side of a grater, grate the butter into the dry ingredients, stirring often to coat the shreds of butter. Blend the egg with the buttermilk. Pour into the dry ingredient mixture and stir lightly with a fork. Turn out on a lightly floured surface and gently form into a round that holds together. Remove when a toothpick inserted in center comes out with just a few clinging crumbs and the top is crusty and golden brown. You may use half whole wheat flour for a more traditional flavor. You may add up to 1 cup of raisins if desired.